Awake renewed at SpringHill Suites Pigeon Forge. Our kid-friendly hotel provides easy access to a plethora of enticing attractions including Dollywood amusement park, the city of Gatlinburg, The Island in Pigeon Forge and the LeConte Center at Pigeon Forge. When you're ready to retire from your adventurous outing, unwind in our modern suites with separate living and sleeping areas. In addition to our complimentary Wi-Fi and plush beds, we also offer ergonomic workstations and mini-refrigerators for your utmost convenience. Visit our on-site laundry room to keep your clothes fresh throughout your travels. Start your day treating your taste buds to delicious healthy and hearty options at our free breakfast buffet. During downtime, enjoy a refreshing swim at our indoor pool or outdoor pool offering a waterslide. Utilize cardio equipment and free weights at our fitness center. Business travelers can host meetings at our event space. 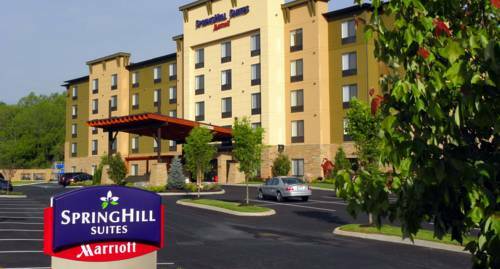 From start to finish, create lasting memories at SpringHill Suites Pigeon Forge.